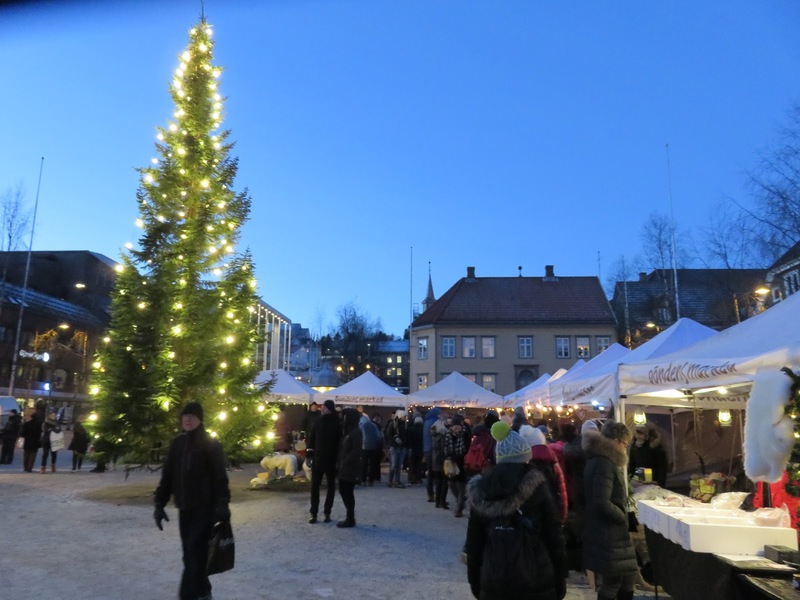 So after the sedate Christmas mood of Norway, it was good to be back in London where you can’t avoid Christmas – lights on every street, trees, decorations, lovely! I am not big into the material/spending side – I’m more about the food, so where else to stock up on a few Christmas pressies than Borough Market? It was suitably decked, as expected. We wandered around, and yes, there were lots of people and lots of stalls. The free samples were mainly for cheese (nope), deli meats (nope), oils (yep). I can’t write too much about the stuff I bought – but it was on the lines of nuts, chutneys and oils. There is so much variety there, it is possible to buy something for everyone! So presents done, we decided to fill our bellies. Thankfully there are so many options for me, but today I was feeling like a spicy stir fry, so I made a beeline to my fav place, L’ailOlive. There is a standard meal that I always order – vegetarian rice noodles with veggie gyoza. Served piping hot with some fried onions on top. This came to about £7.50, more expensive than Mr. A’s Ethiopian box that was jam packed with meat, veggies and rice for only £5. 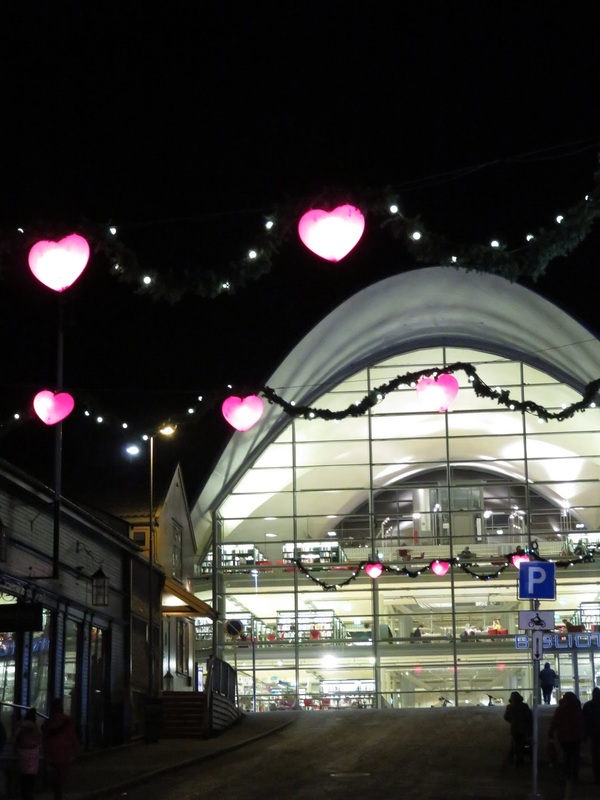 I should also say that they were served by a very Christmas-y lady, decked in a jumper, tinsel, baubles – and she had even done her nails – loved it!! Now L’ailOlive specialise in garlic and chilli products, and they always have a couple of sauces to pimp our food with. One contains dried shrimp, but the other one…ho ho ho (pun intended). The Super Hot Garlic Peperoncino is dynamite, literally as the name suggests, super hot – and that comes from someone who can handle her chillies! The kick is spectacular – and I’ve learned from experience to use this oil sparingly – amazing flavour, but definitely use with caution! The stir fry was super delicious – hitting the spot on a cold London day. Next – dessert. 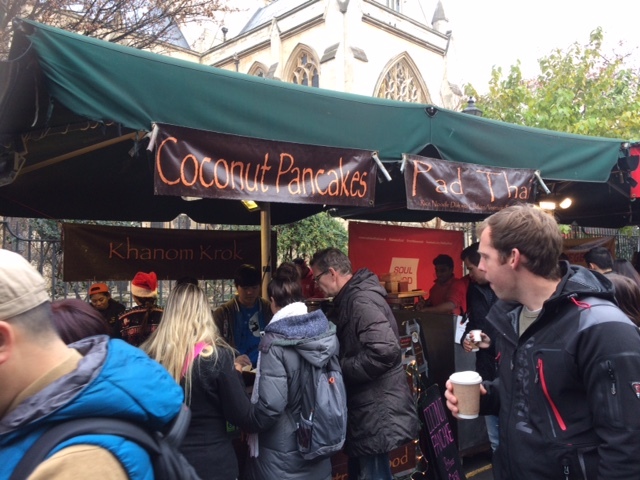 Keeping with the Thai theme, Mr. A spotted a place selling coconut pancakes – dairy free! 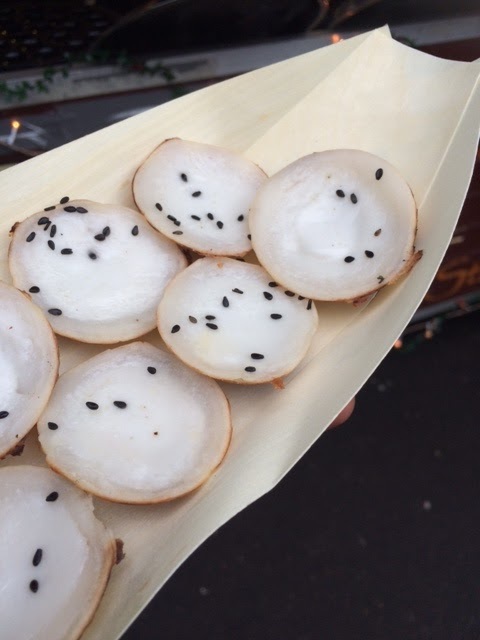 Made with coconut milk and rice flour, they looked like little discs of snow, dotted with black sesame seeds. 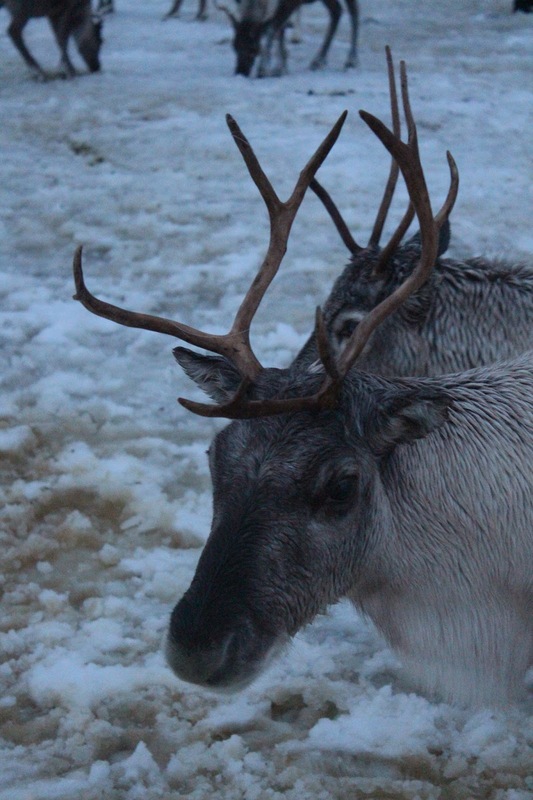 Today’s plan was to check out the reindeer, and spend the rest of the day basically being lazy. 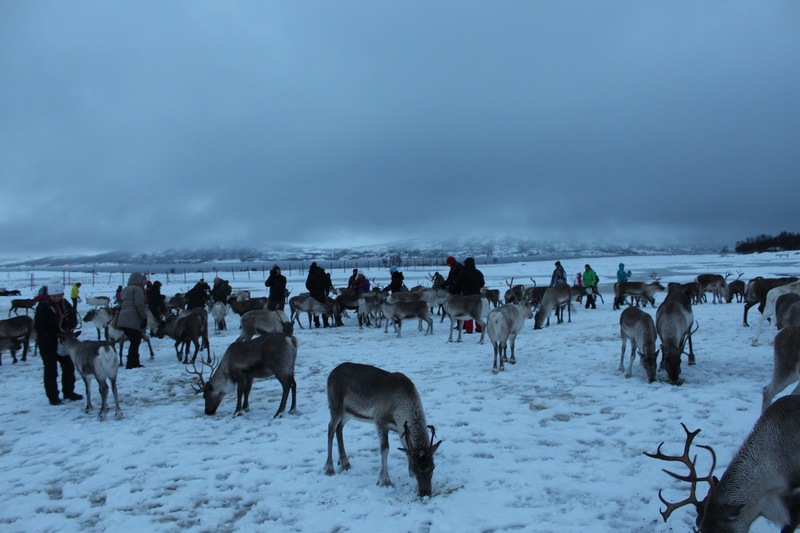 We had booked a tour with Tromso Arctic Reindeer for a Reindeer and Sami experience. Once again, we were picked up from the hotel (yay! ), this time in a coach with about 50 other people. 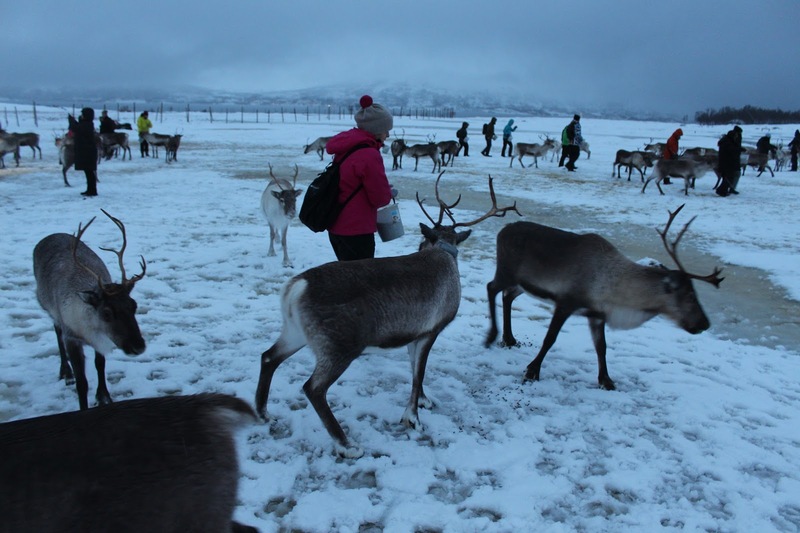 We drove just 25 minutes outside Tromso city centre to a custom, tourist made, Sami/Reindeer site. We met our hosts, a lovely Sami man and his fiance in a giant lavuu that had a roaring fire. They were traditionally dressed and looked very attractive. 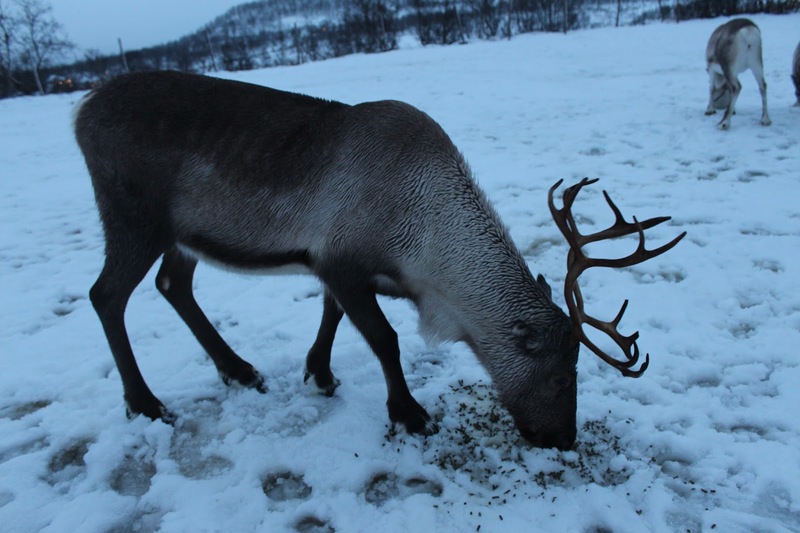 We were first going to feed the reindeer and then come back to a Lavuu to have some lunch and to hear about the Sami – history and current situation. 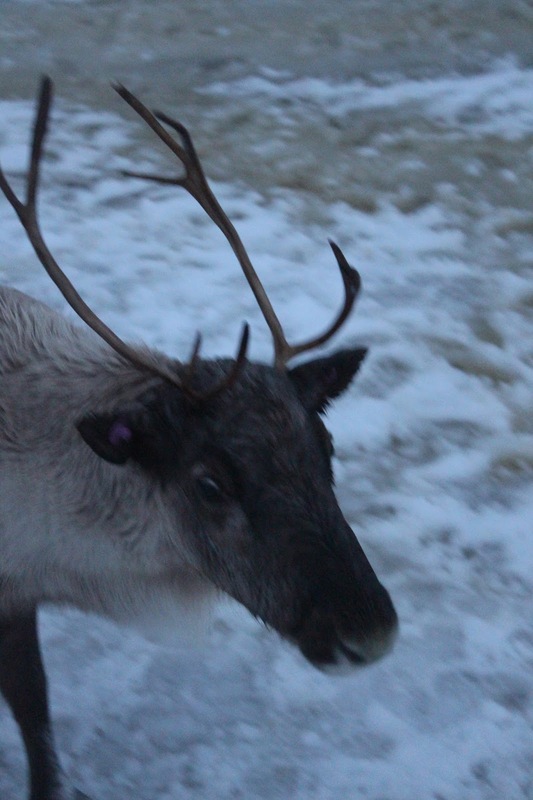 So, equipped with buckets off feed, off we went to feed the greedy reindeer. After a couple of minutes holding the bucket and being pushed around, I’d had enough of the feeding and switched to taking pics. We then wandered back in the lavuu for a truly interesting talk on the Sami, their history, what they wear, their accessories, how they protect themselves in this harsh environment. Very informative and enjoyable. As for the food? A reindeer stew which was strongly ‘scented’ (being polite here), and a veggie, dairy filled cous cous option. So no food for me. 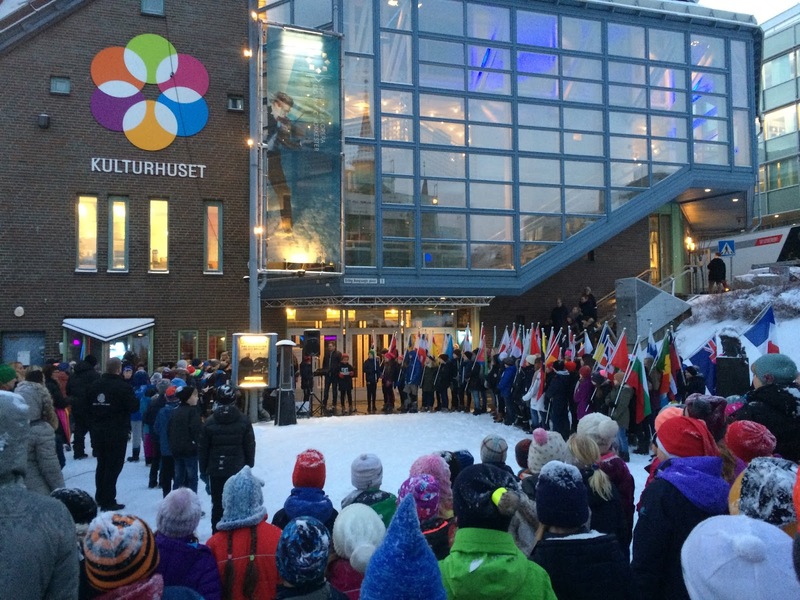 The best part of the day was the Sami talk – and that was it really. 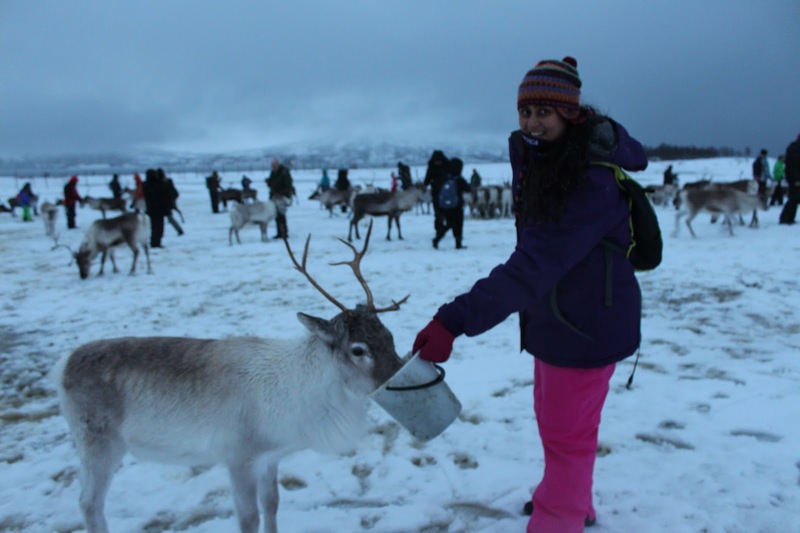 But if you do want to get close and personal to lots of reindeer, then definitely do this if you’re out there. We got back to the hotel for 2pm, did a bit of packing, and a bit of window shopping. So far we haven’t done any serious shopping yet, other than buying lefse and Kvikk Lunsj, Norway’s answer to Kit Kat. 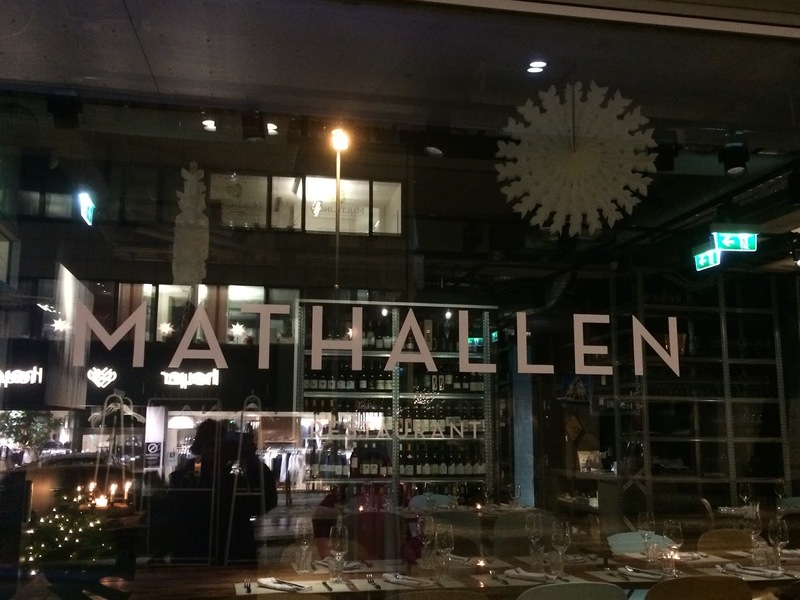 But first, a coffee in a deli, Mathallen. 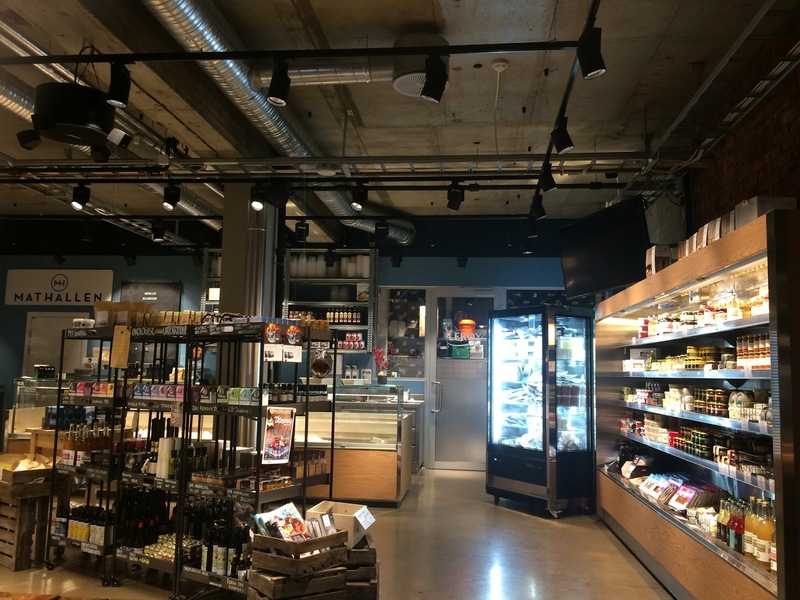 This was a beautiful space, with lots of tempting items to buy, but all we wanted was a coffee. 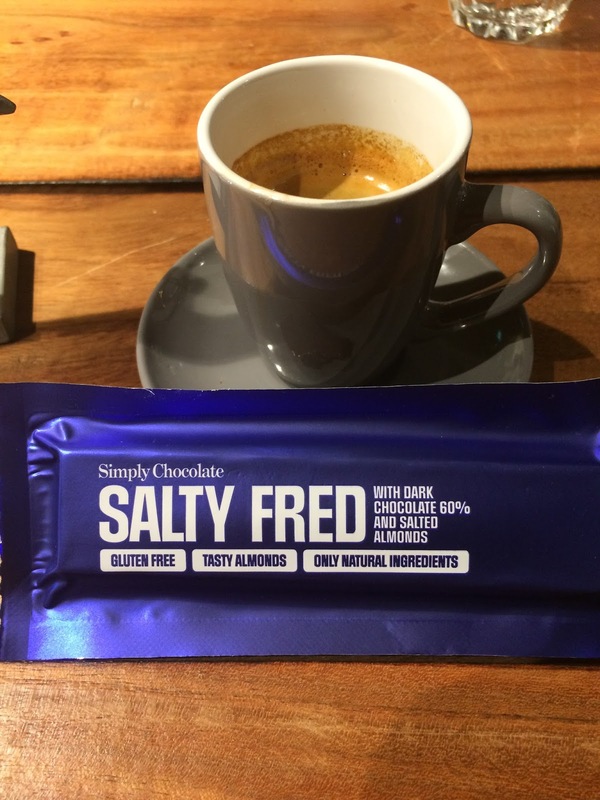 So after a quick espresso (not the worst, but not the best) + a couple of pieces of salted almond chocolate (from Copenhagen), and we were ready to wander for a couple of hours before dinner. We were hungry, since we hadn’t had lunch (M didn’t want to try the reindeer soup – and S wasn’t joining us, she was going for Northern Lights part deux) but we thought we could hold out. We found a spa to book a massage for the final day of the holiday, went to the polar museum and the tourist shops to check the tourist tat – and boy, there was a lot of it out there. It was really enjoyable walking around, and we also nipped into the library and chilled and read a few comic books – brilliant. One of guides told us that you can borrow a book from any town or city in Norway and return it in another. 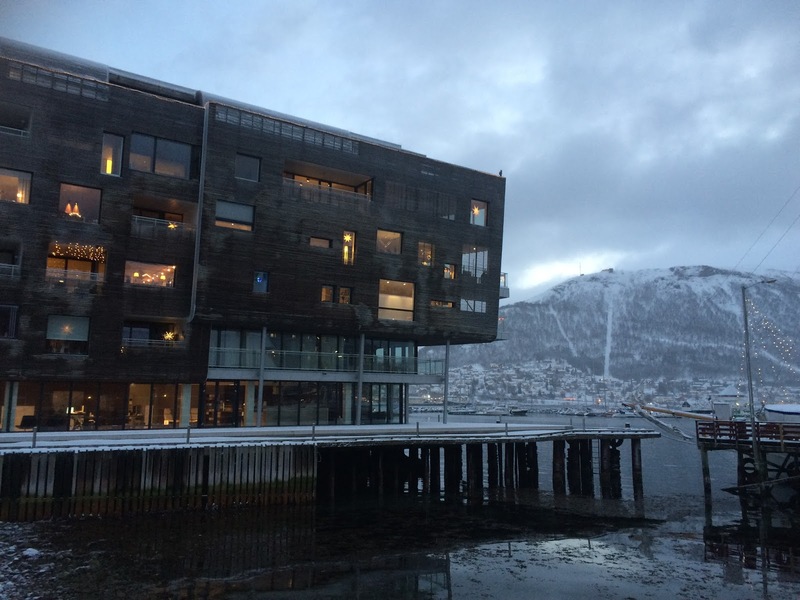 So I could borrow a book in Tromso and return it in Oslo…how cool is that! 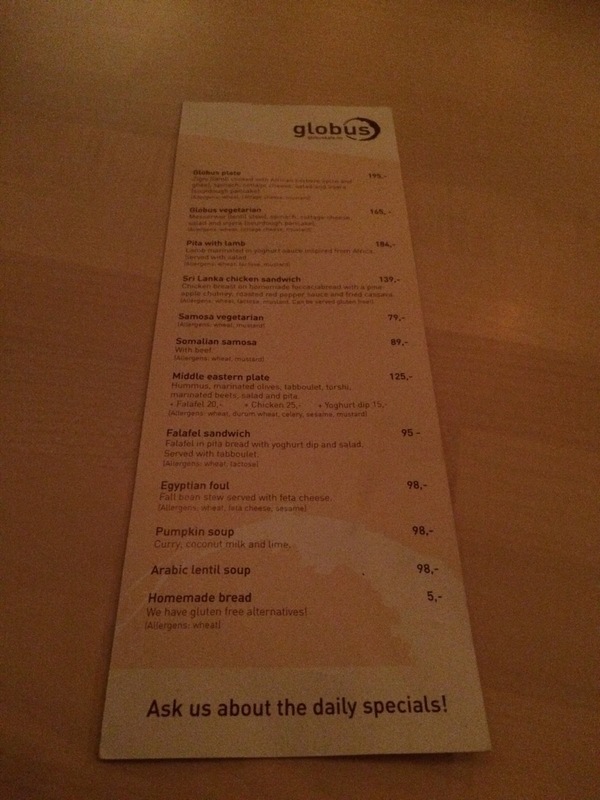 So after reading Nordic anime-esque comics about Thor’s daughter and Vikings, off we went to Kafe Globus (or if you’re M, it’s bobus/nobus/anythingbutglobus rofl rofl) a cafe with international cuisine that had.. wait for it.. VEGAN CUPCAKES. Whoop Whoop. A beautiful space once again, with a very relaxed vibe. Very reasonable, cheaper than most other places we visited. See what you want, order, pay and sit back and relax. 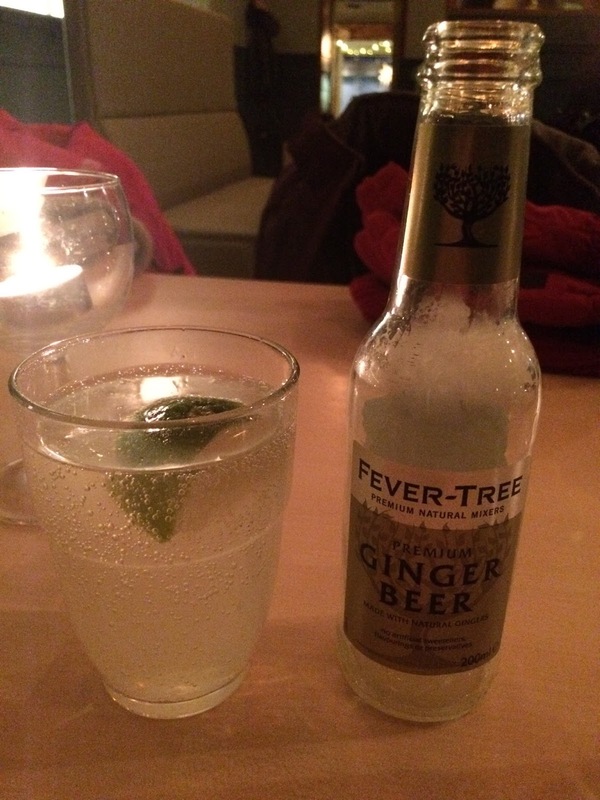 I ordered a ginger beer..mm.. zingy..
And a middle eastern plate with extra falafels. It came loaded with a salad, tabbouleh, olives, beetroot, pickled veggies.. and houmous. YUMMY! I love that stuff and I eat it virtually every day – so not eating it for almost a week and then getting it… I was one happy bunny. As for the rest? Fresh, crunchy, spicy, juicy… most enjoyable. M’s plate was identical – but with extra chicken and yogurt dip. Suitably full, I made sure I left room for dessert – vegan chocolate cake accompanied by a jasmine tea. It was a big hunk of cake with icing – and yes, I ate it all. 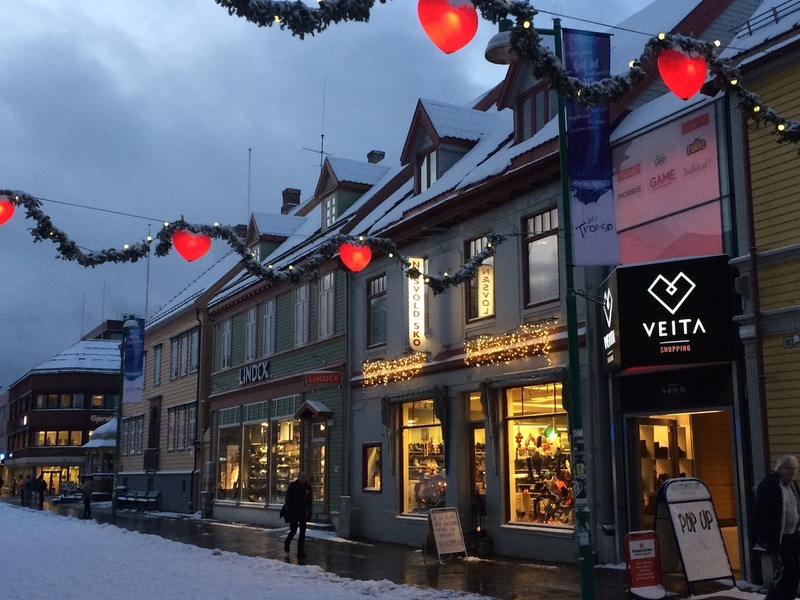 On our last day in Tromso, after a late start and a leisurely breakfast, we did some shopping and took a final walk around the city centre.. so pretty! Time for our final meal in Tromso – lunch at what is supposed to be one of the best restaurants in Tromso, Emma’s Drommekjokken, or Emma’s Dream Kitchen. Another small restaurant, no more than 15 tables, but beautifully done up. The menu here was also short and sweet, and they had a vegan option (with houmous!!) with me even asking for one 🙂 The owner mentioned that the Head Chef has worked with Jamie Oliver and it was Jamie’s influence. Go Jamie..
We started off with a glass (or two) of sparkling wine..
My meal with essentially a salad with hummus and roasted root veggies – ginormous and oh so tasty. Every mouthful was full of texture and brimming with flavour. The girls went for the baked clip fish, sitting on a mound of creamy mash. 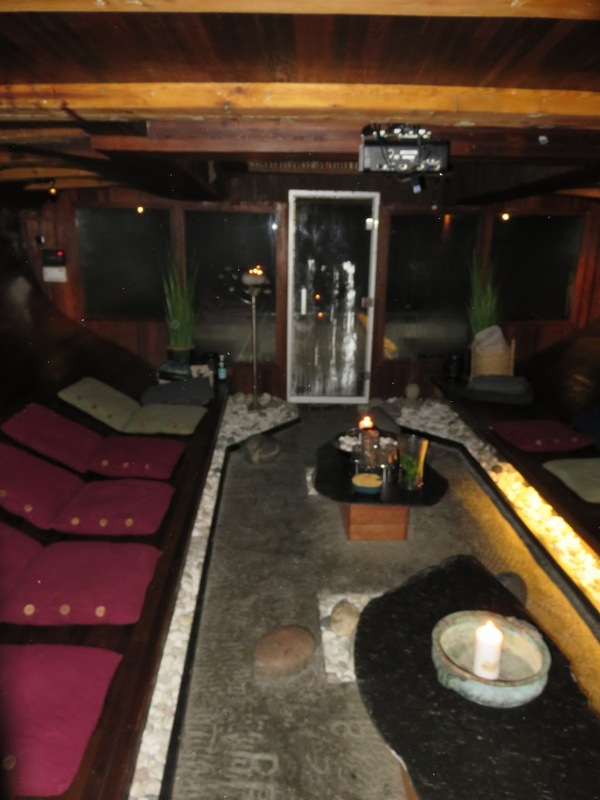 No room – or time for dessert, we paid about £48 each and legged it to Essens Spa for a massage. My masseuse was also a physiotherapist, so my massage turned into a proper deep tissue, painful at the time but so relaxing afterwards massage. It cost £80 for 45 minutes, but it was exactly what my muscles needed! So leaving the spa completely relaxed, after 2 days of chasing, Wandering Owl said they couldn’t leave my scarf anywhere convenient (for them!!) so M and I spend 40 minutes power walking up and down a very steep hill to a residential part of Tromso to retrieve it. Letter to self – don’t forget anything when you go on an activity with them! We rushed back to the hotel, rushed to the airport, rushed to the gate… and relaxed. Day 6 of our arctic adventure, and I loved the pace and the fact that, although we had a packed enough activities, we also had enough downtime to lounge about – chilling in the hotel playing GoT Monopoly!!! If you are a Thrones fan, you will love this version of Monopoly – loved playing it but let us not talk about who won. By this time breakfast was getting pretty boring, so I had some cereal and yogurt and then we walked about 5 minutes to a floating jetty to board the boat for whale watching. 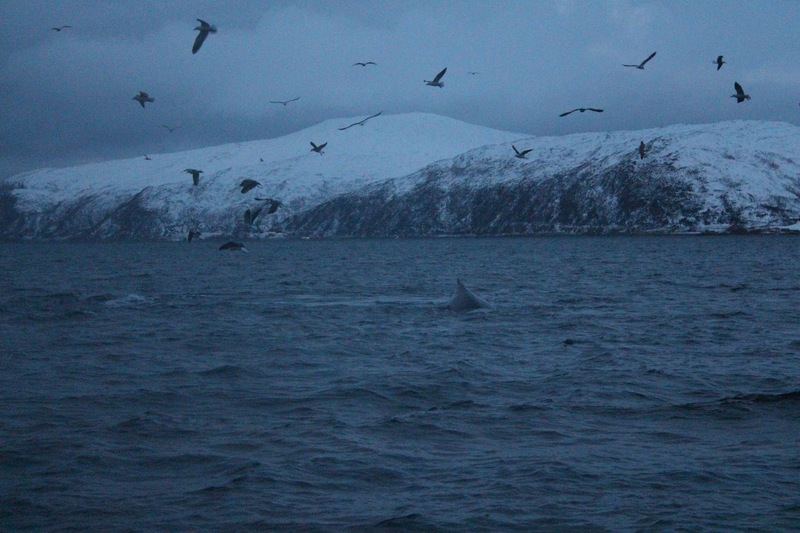 We had a very hands off crew – a skipper and a ‘guide’ who did no guiding of any sort. An hour into sea, we stopped to see some orcas and humpbacks. I have my standard lens on my SLR, and we were too far to get any decent shots. I soon realised that, put the camera away and decided to just watch the whales through binoculars – much better. It was freezing cold, and to be honest, after about 10 minutes, the whales disappeared and we didn’t have much luck seeing them again. Along with the whale watching, we saw these ‘RIB’ boats literally on top of the whales – not sure how I felt about that, completely exposed and out there. We got back to shore by 2pm. In hindsight, I wouldn’t recommend this company for this activity, and more importantly, I wouldn’t recommend this activity. After learning more about whales and their behaviour from our crazy South African guide (coming up shortly), whale watching in RIB boats or big boats or any boats is intrusive and invasive to the whales, and many whales have been seriously injured as these boats invade into their territory. So never again. Rant over. I could choose the coffee, the intensity, how it is brewed, everything. 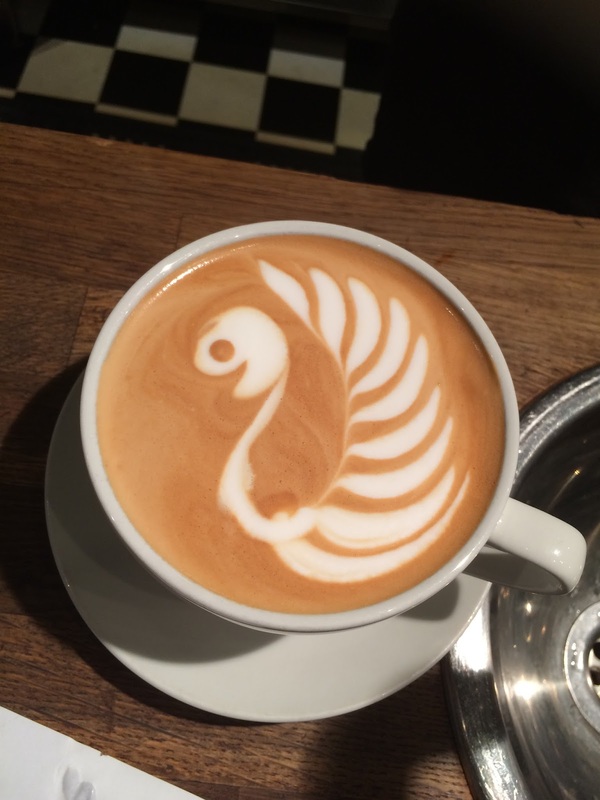 It was seriously good coffee. 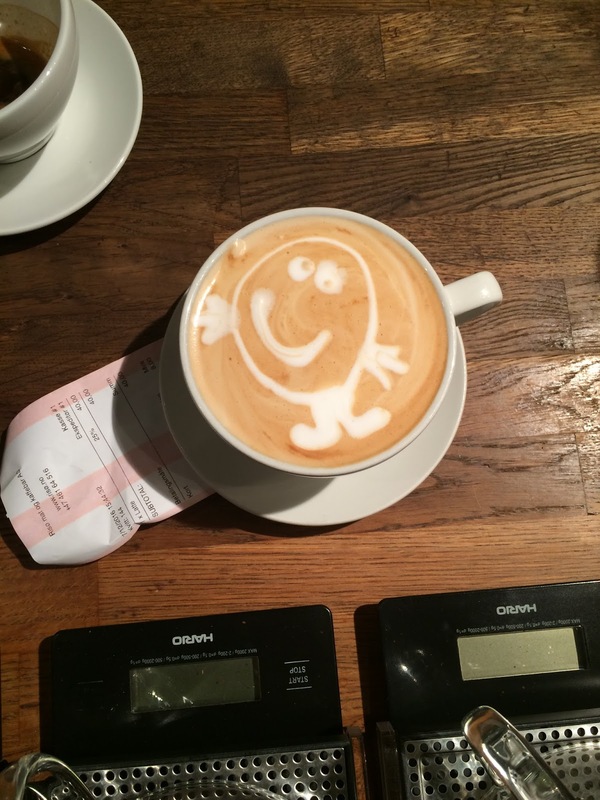 As we were leaving we got chatting to the baristas. Turns out one of them was flying to London, and asked for good coffee shops, so I mentioned Notes, Prufrock and Workshop (Thanks C!). 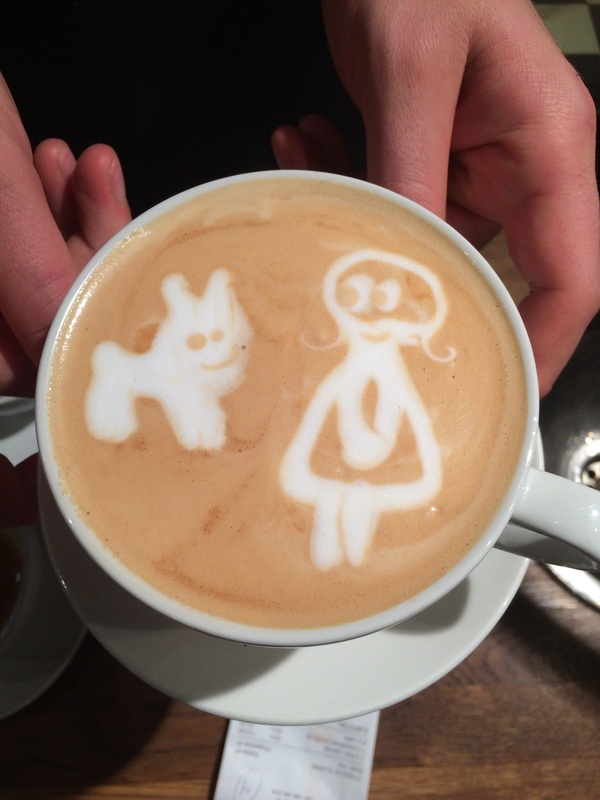 They thanked us by letting us admire their coffee art. Very cool! 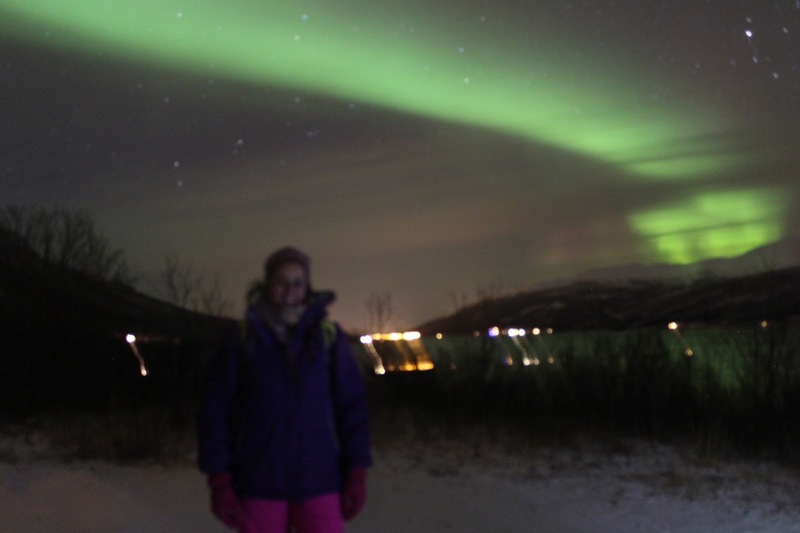 We wandered over to the Tromso Tourist Office for our night time activity pickup, a night snowshoe walk with Wandering Owl. Our guide was this super passionate, South African conservationist, who knew everything about everything. My knees which are temperamental at the best of times did not enjoy this snow walk – I would have appreciated being told BEFORE we set off that it wouldn’t be a snow shoe walk, but that didn’t seem to be relevant. 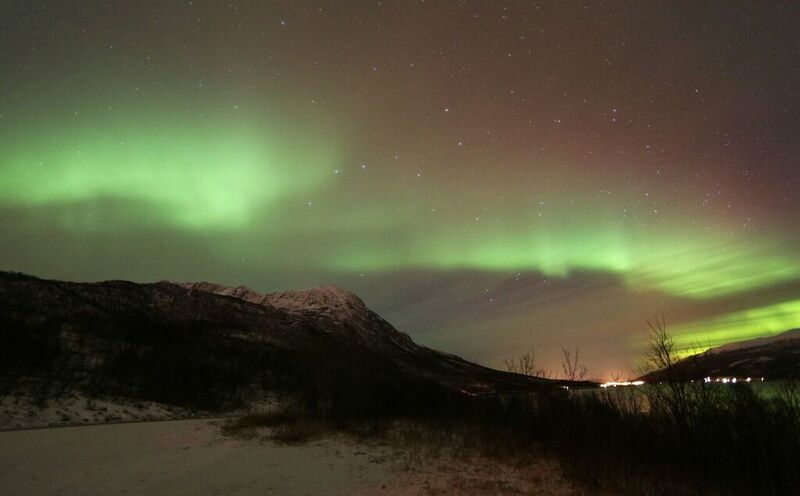 And to top it all, I forgot my scarf in the van, and it proved too difficult for Wandering Owl to drop it off to the hotel (a minute drive from the Tromso Tourist Office), so that resulted in another adventure on our last day. To end on a happy note – I had bought a pair of snow boots about 3 years ago, when they started predicting the ‘worst winter yet’. Haven’t used them even once in London to date, but I brought them to use in Tromso. And I wore them everyday. They were for £20 – they still are – and they were brilliant!! 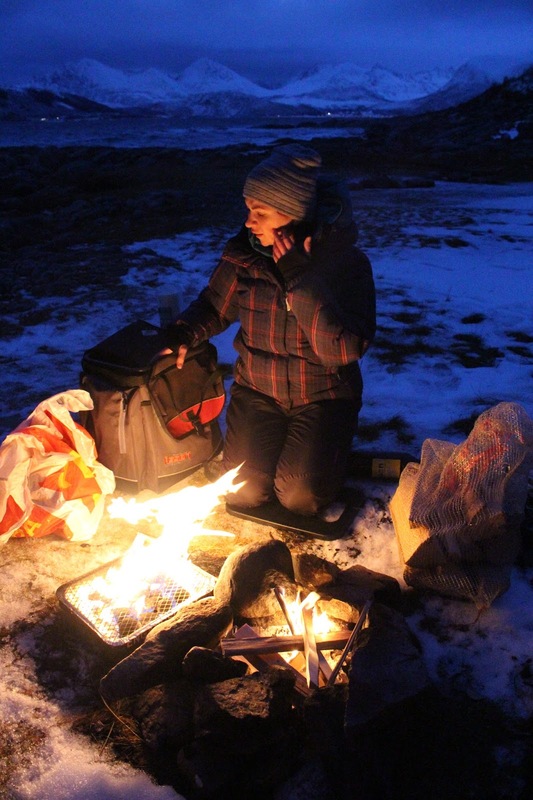 The brand is Quechua and they are warm, waterproof, comfortable – if you don’t want to spend a truckload and get something that will do the trick – buy these!! Today we met a real life superwoman. So post breakfast (avo on toast, how can you go wrong), yogurt and a hot cup of tea, we wandered outside the hotel to wait for our pick up. Activity of the day: Snowshoe hill walking. 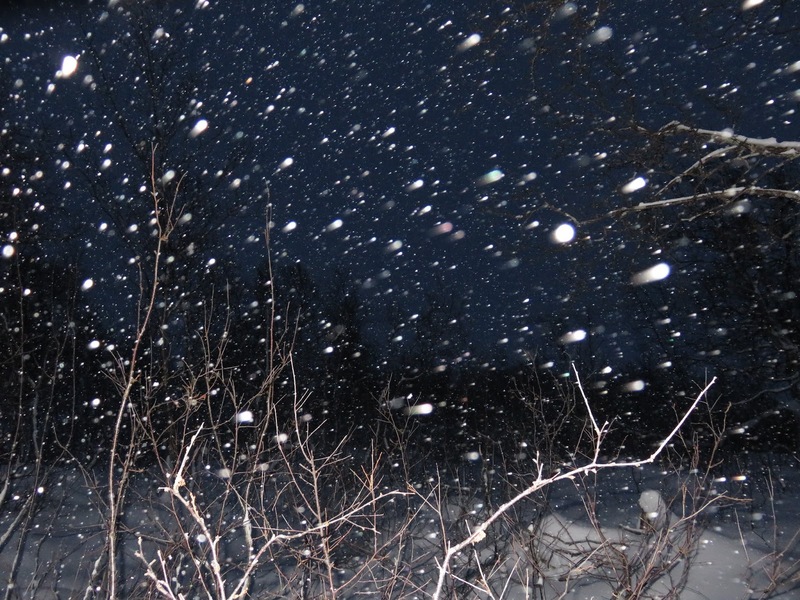 Weather: heavy overnight snowfall, and it was still falling. Magda from Tromso Outdoor showed up on time, all smiles and positivity. We drove out to Kvaloya again, seems like this is the activity island. The weather was very cold, thankfully it had stopped (for the moment), long enough for her to give us a mini tutorial on show shoes wearing, walking – and the fact that you should definitely not walk backward in them. We were 5 females excluding Magda – my gang of three and 2 other ladies. The snow was up to a foot deep in places, so we definitely used our snowshoes to make our way through the snow. It was a very enjoyable, calm walk, with enough stops and regular check-ups from Magda to ensure we were all OK.
Two thirds the way up was when everything changed. We were basically attacked by the snow – there was a total whiteout, we couldn’t see more than five feet ahead of us, snow hitting us from all directions, the wind pushing us over. We had to stop. That is when Magda the superwoman kicked in. She made sure we were all OK, fed us (yes, more lefse, but this time she had jammie dodgers for me – whoo!) and that hot, sweet Ribena. We basically had to stay put while the snow and wind settled down a bit – in the meantime Magda showed us all these exercises to keep warm – which was handy since one of the girls was complaining about ‘her fingers feeling funny’ arrrggghh! We couldn’t make it up to the top of our mini mountain so Magda decided to take us back down. But with those blizzardy conditions and it starting to get dark (it was 1pm), we took the scenic route through this mini wood to shield us from the wind and snow. And we all made it in one piece down to the van – got in, got warm, only to discover that it was stuck in the snow! The adventure was not over yet! So once again, super Magda got out of the car, completely calm and collected, and tried to shovel our way out. 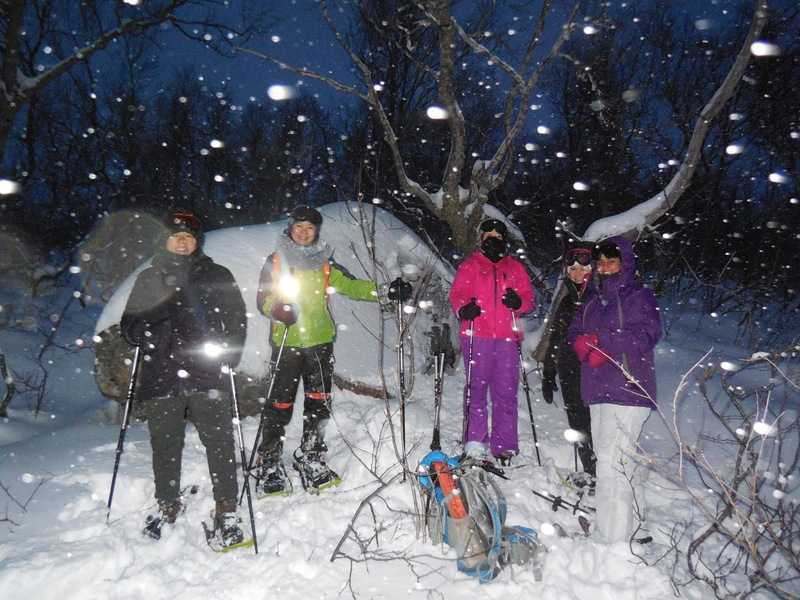 Unfortunately there had been so much snow – which meant we all had to get out and use our feet and hands and whatever else to make a path through the snow to the main road – in pitch darkness. Fun and games – it took an hour – but we did it. Go girl power! and go Magda – one of the best guides I’ve seen! Back at the hotel, we didn’t have much time to relax as we had an escape room to look forward to. There are a few of these in London, I’ve been to one near Bank station and it was brilliant. This one was just as good – Arctic Escape (the northern most escape room, we were told). We spent an hour solving the puzzle in John Winter’s room – and thanks to S, escaped with 6 minutes to spare. 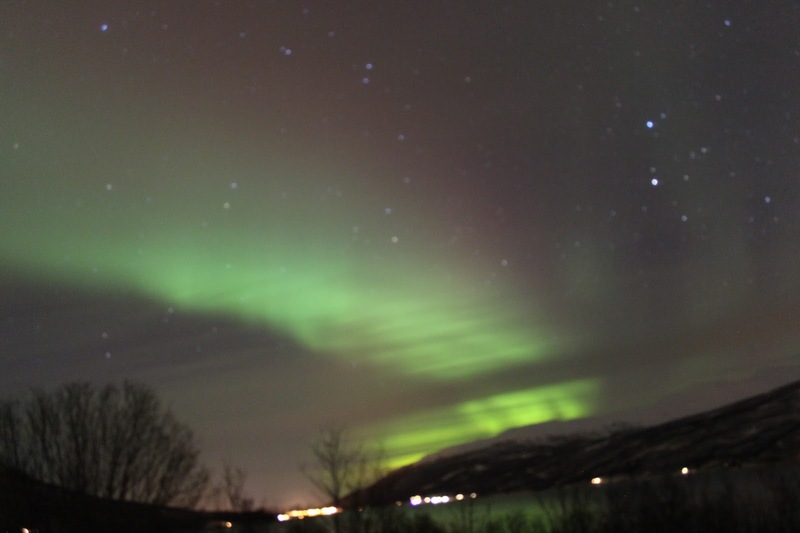 Strongly recommend this if you’re in Tromso! 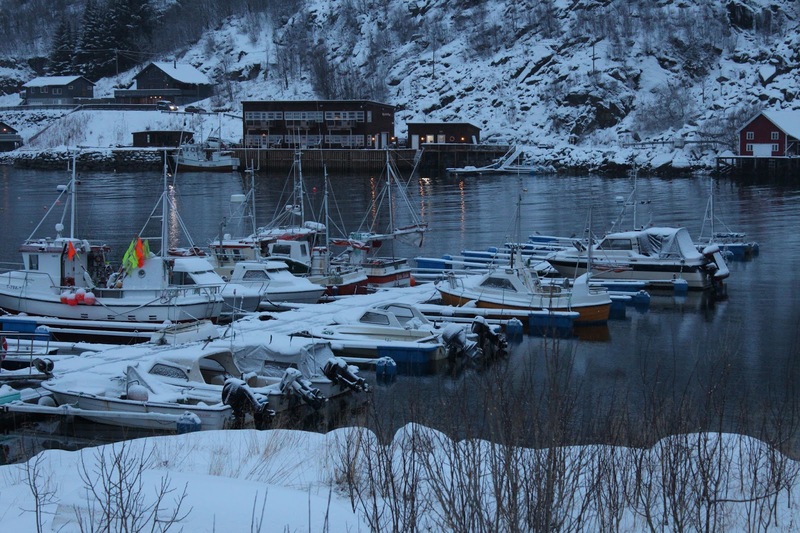 Suitably charged and ready for some food, we looked at our list of recommendations from the lovely Norwegian girls we met on the Vulkana, and down the road from Arctic Escape was Bardus Bistro. 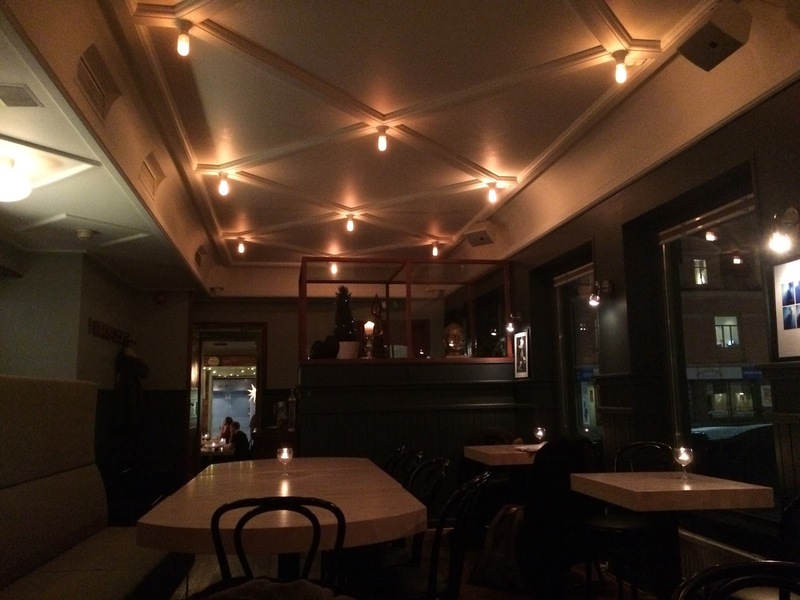 A beautiful, cosy space and a short menu. Mains were approximately £30 each. Not cheap for me, but as I’ve mentioned before, we quickly realised Tromso isn’t cheap, and decent restaurants meant shelling out a bit more. Once again, there was nothing on the menu for me, but I was told there is a vegan risotto – so yes please! What arrived was this beautiful plate of pearl barley, butternut squash, celery, mushrooms, lingonberries and dill. What a stunning combination – I enjoyed every mouthful, from beginning to end. It was so filling, there was no room for dessert – but I did order an espresso – that came with a square of dark chocolate. Sorted. 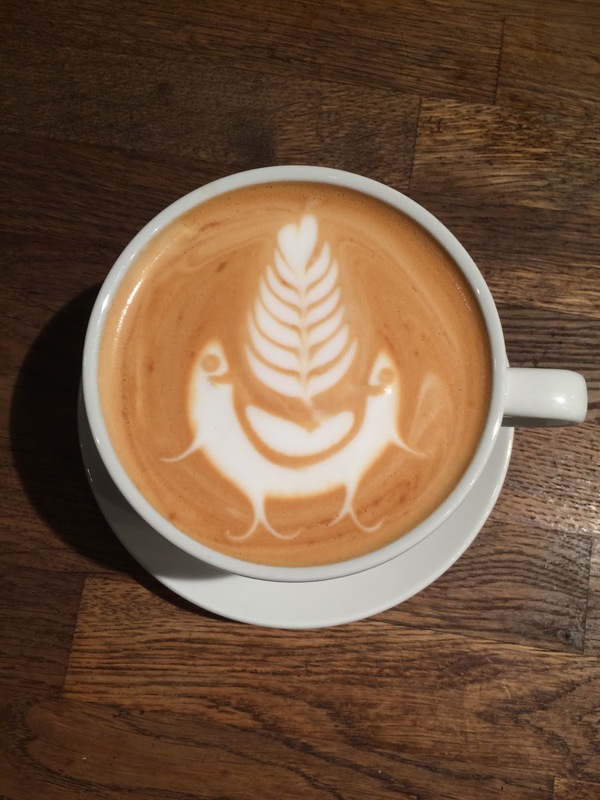 Seriously good coffee after the crappy coffee I’d been drinking. A wonderful meal, couldn’t ask for a better way to end the day – the most adventurous so far! 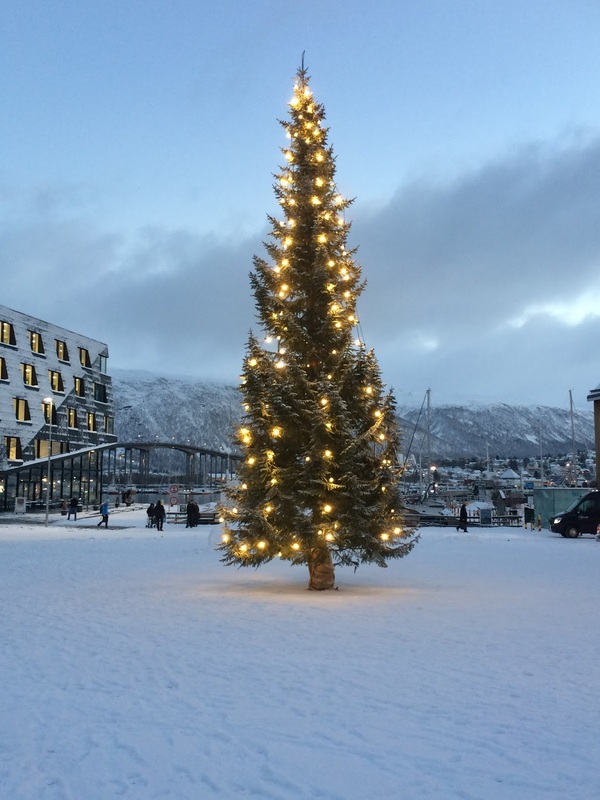 Since we were in Tromso for just a week, we planned our itinerary to ensure that we do at least one activity a day, and today’s was supposed to be cross country skiing. I say supposed – because as the keen amongst you may have figured out – it didn’t happen. Reason: no snow. No Snow?!?!? 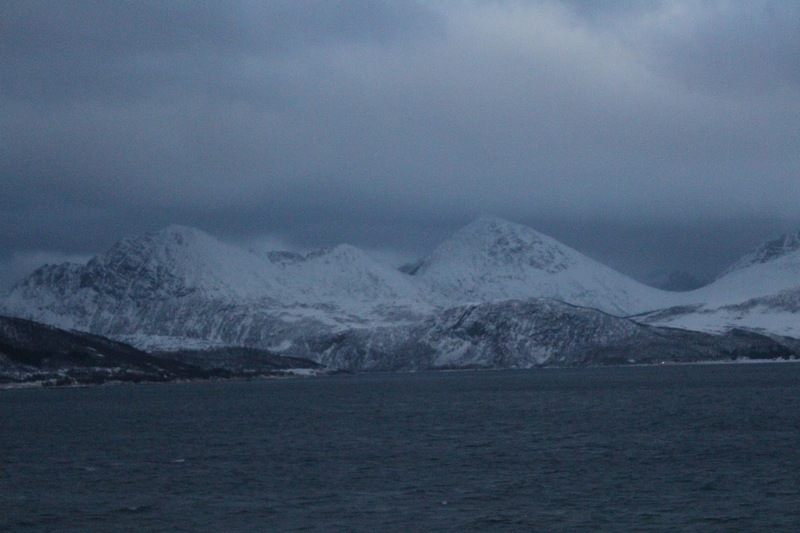 We’re in the Arctic Circle! Apparently everything is a month late, so there hasn’t been much snow because it has been warmer than usual at this time of the year. Yes. Warmer than usual. This meant that our activity turned into a snow hike. So after a late breakfast and a leisurely morning, we waited for our guide, Michael from Tromso Outdoor. It turned out the only people booked in were the three of us – private tour…perfect! This is the place you need to go to for a number of tours, but more importantly, ski and snow gear – everything – that you can hire for very reasonable prices. Definitely worth looking into when you’re planning your visit. 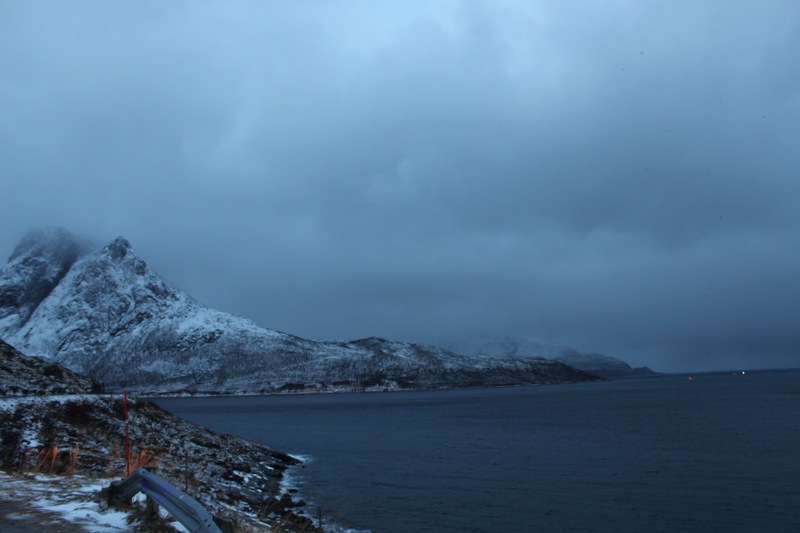 We drove out to Kvaloya, the Whale Island and found a suitable snowy hill to hike up – crampons, hiking poles and all. The views were magical – both on the drive and hike. So utterly breath taking and I enjoyed every single minute of it – so calming and peaceful. We made it back to the car where a hot drink was waiting for us – which was essentially hot Ribena, exactly what was needed after a long hike. The girls also got to have some Lefse, which was the standard snack on the Tromso Outdoor tours – essentially a bready pancake sandwiched with a buttery nutmeg mixture. Obviously off limits for me, I came equipped with my current favourite, a Primal Pantry Cashew and Almond bar. We got back to the hotel, changed into our robes and off to the sauna on the top floor for a bit of muscle loosening action – which we needed more than we realised! 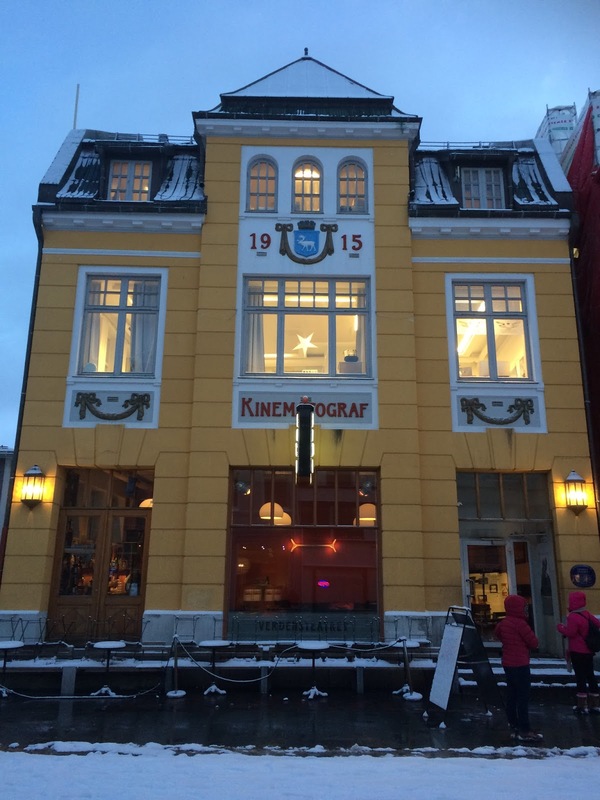 Being a Sunday, we were told that there were literally only 4 restaurants and coffee shops open in Tromso – so we decided to go one that was open as we didn’t want to eat in the restaurant. We found Aungarden, which was sadly a slaughterhouse in a previous lifetime. Crisp lettuce, fried potatoes, fresh tomatoes… and a single asparagus. Most enjoyable, and exactly what I needed, although I could have done with more asparagus! The next day was another activity, M & I were off to see the famous Norwegian fjords and S was off Husky Sledging. Breakfast was more or less the same, literally nothing to write home about. 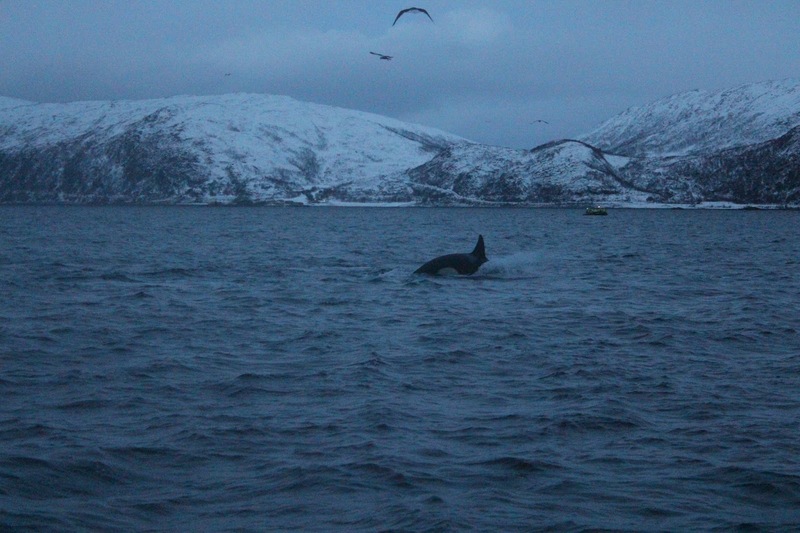 We were booked on the Fjord tour with Enjoy The Arctic and we were picked up by our slightly crazy guide Anna. 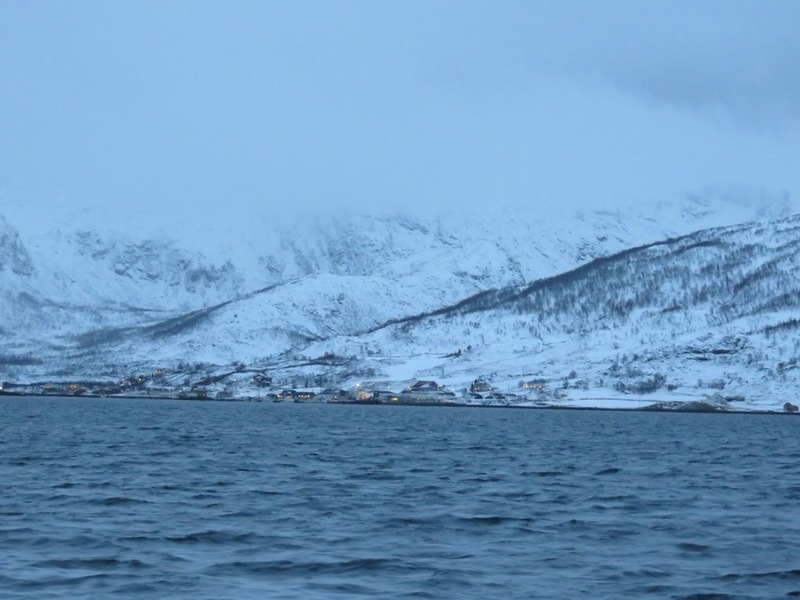 So being in the Arctic, we went from not having enough snow to ski to a proper snow blizzard – so much so that Anna was convinced that we’ll drive to Kvaloya, hang around for 20 min and drive back. She was wrong! 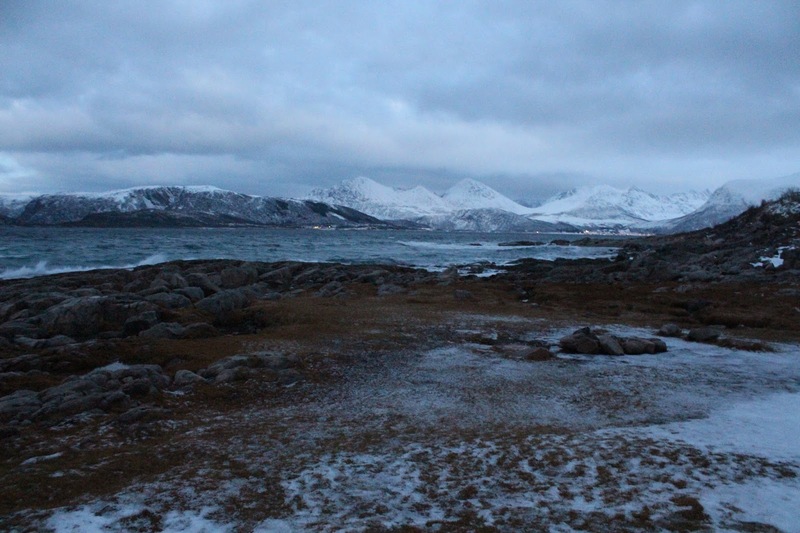 What I also realised about being in the Arctic, is how quickly the weather changes! It suddenly cleared up and we were left with relatively clear skies! Result. The scenery was nothing short of magical – it was literally like being in another world – I think the daylight – or the ‘sun doesn’t rise above the horizon’ light had a lot to do with it. 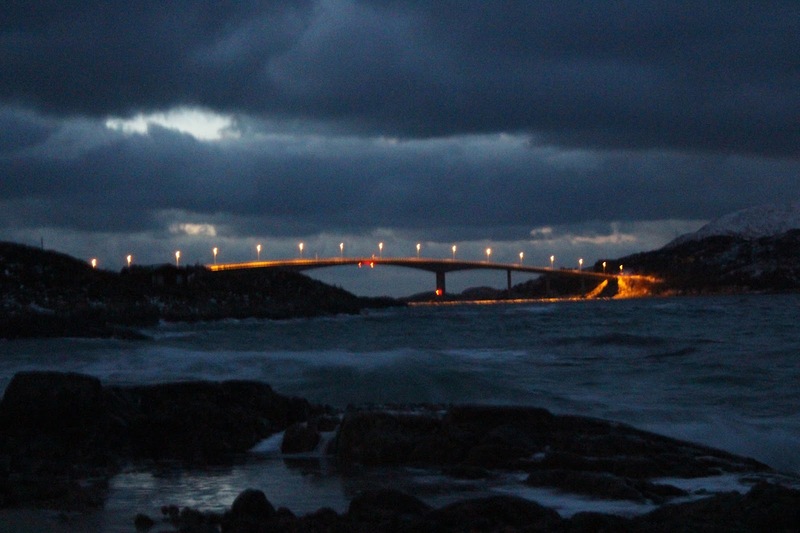 We spent the morning driving, stopping for photos, driving to another fjord, repeat. The views were just stunning – breathtaking. 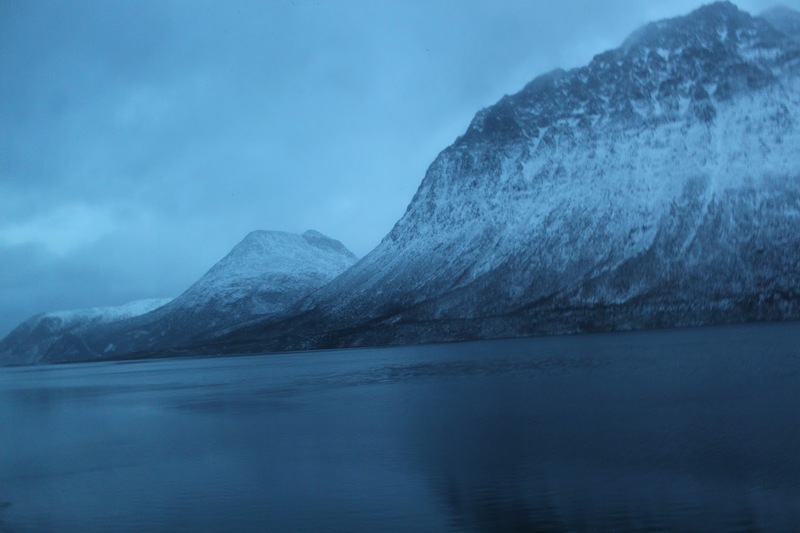 When we got to kattfjord, Anna started squealing – why? 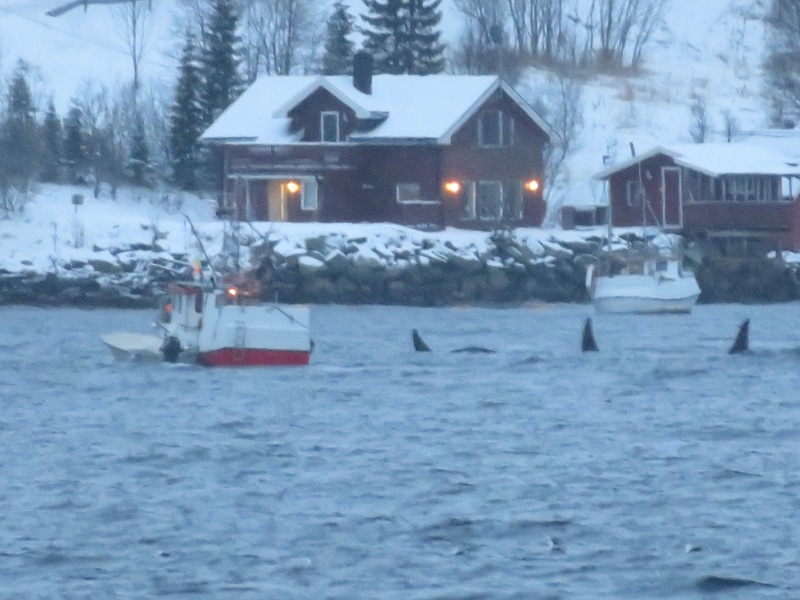 Whales!! 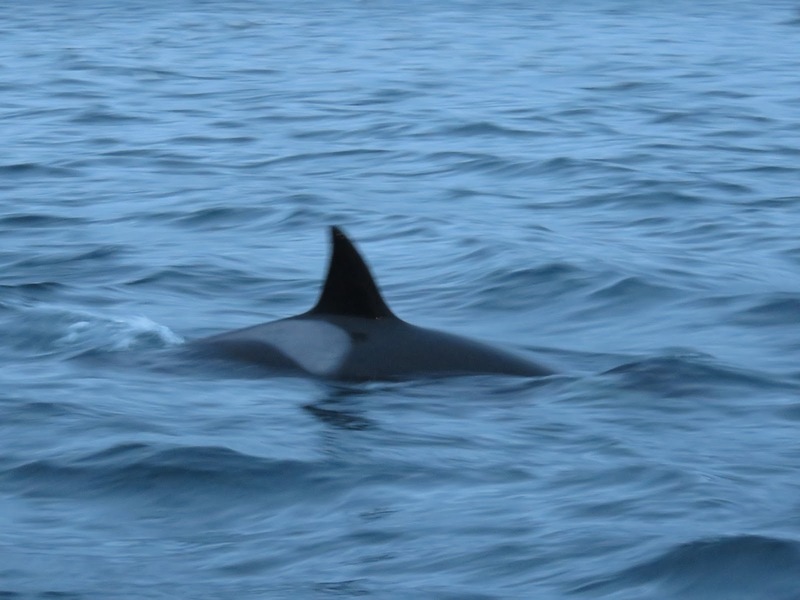 We saw a massive pod of orcas!! Apparently seeing so many, so close to the shore is very rare – she called it the viewing of the season – and who are we to complain! Penultimate stop – Summaroy, or the summer island. Apparently this is the place that people hang out in the summer, have picnics, swim in the sea, because it gets to a balmy 15 degrees! Now if you look at these photos, you might think you’re on some tropical beach (replace clouds with blue skies). It might have looked like that, but the gale force arctic winds stopped it from feeling anywhere close to that. 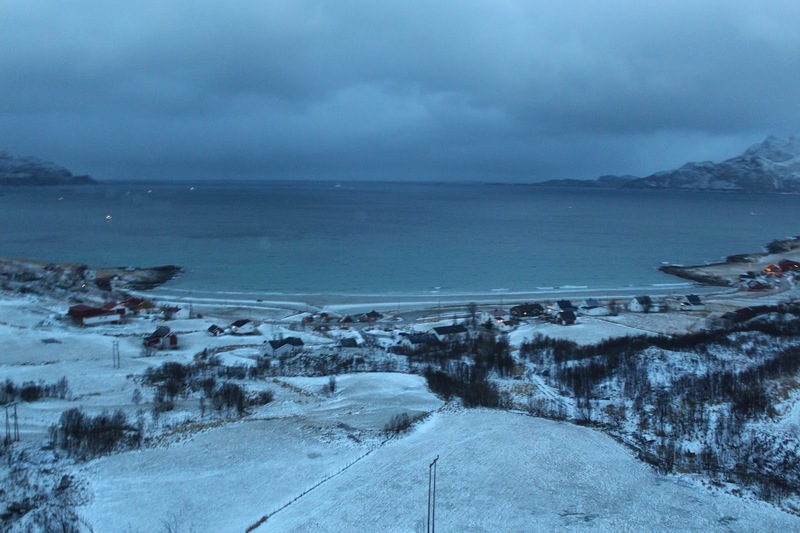 Don’t be fooled, that wasn’t surf on the beach – it was snow! This is the first time I’ve seen that combo! 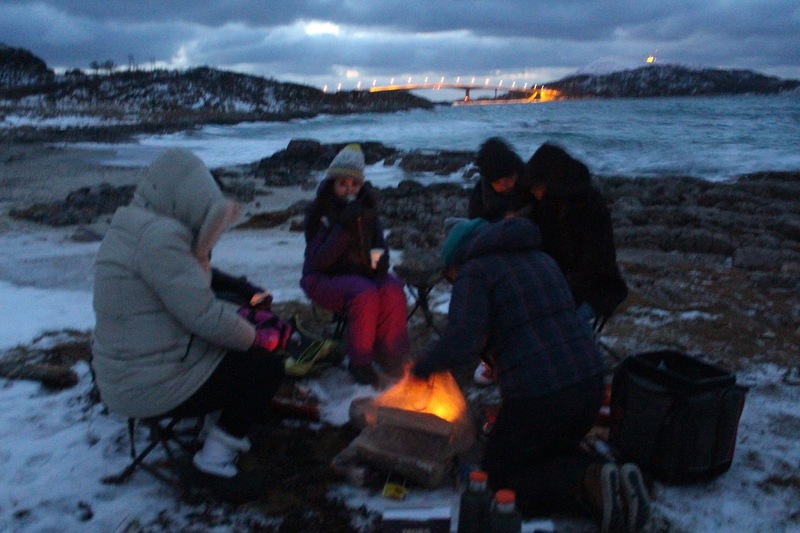 Final stop – another beach, where Anna attempted to light a fire and cook our snack. Hot dogs in wraps for the meat eaters, along with a stick of dried reindeer meat, which M dutifully informed looked and tasted like pepperami. For me – a vegan burger, which, in that cold and after 4 hours of sightseeing was very welcome. 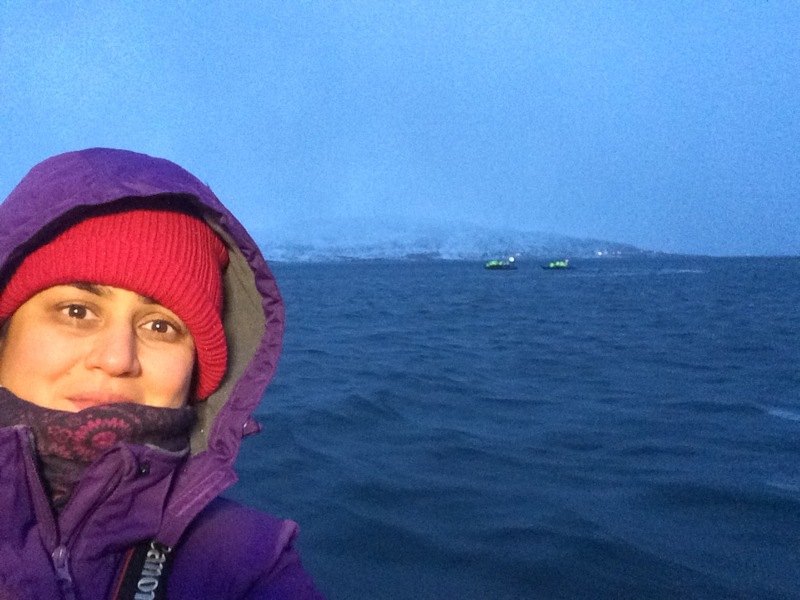 Talking about cold – I donned a thermal suit on top of all my layers and my salopettes and my ski jacket – I was the Michelin (wo)Man!!! Getting the thermal suit on could actually be a separate blog post on it’s own, but I’ll spare myself the pain of that. haha! 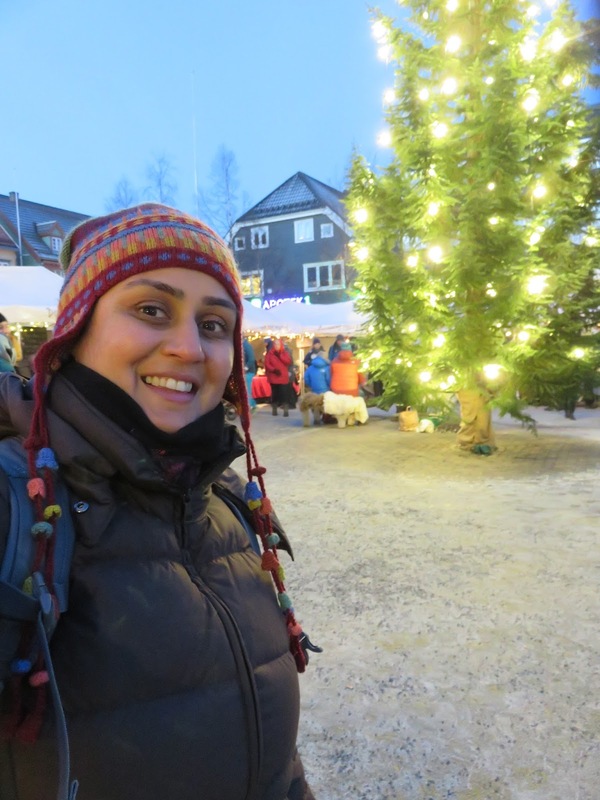 After the meal, the snow started again, and we endured a scary ride back to our hotel – driving like maniac on icy roads was our final adventure experience for the day – thank you Anna! We were all exhausted, so we nipped into Pastafabrikken, which was literally a minute’s walk from our hotel. It is one of those Scandi cool places in terms of decor and style, and I knew that with an Italian-esque menu, there would be something I would find to eat. My bowl of veggie soup arrived with a load of crusty bread. For £11, it was absolutely delicious, packed with lots of vegetables – and one of the cheaper meals we had! 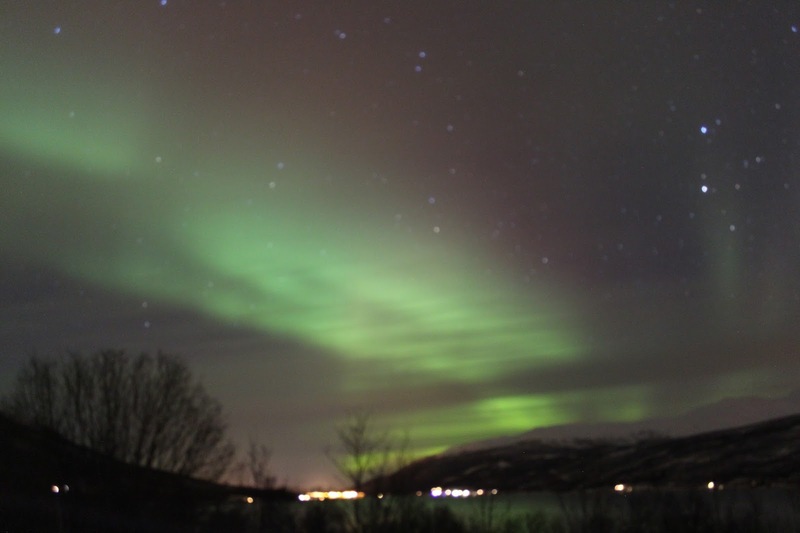 Another fine day in Tromso, this one full of mind numbingly (is that a word? It is in my world!) beautiful nature, breathtaking sceneries, adventure and a hot bowl of soup! Thank you Universe!! 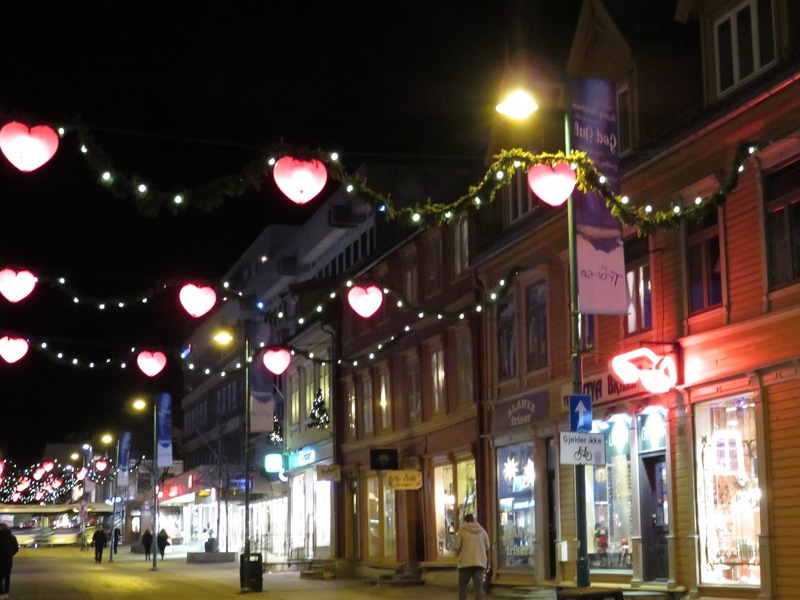 PB Travels… Tromso – Spa, City Walk and Lights! Or roasted tomatoes on toast (don’t knock it until you’ve tried it). Over the week I did supplement it with my handy pip and nut peanut and almond butter squeezies, along with some supermarkets bought Alpro soya yogurts and avocado. And the bread. Oh. The. Bread. Different kinds, rye, wheat, nuts, seeds, unidentified ingredients, but all so good. First activity of the day (as per our customised itinerary, thank you M) was on the Vulkana for.. wait for it… a spa day! on a boat! So we boarded what looked like a normal fishing boat.. if you can call having a hamam, sauna and hot tub normal! 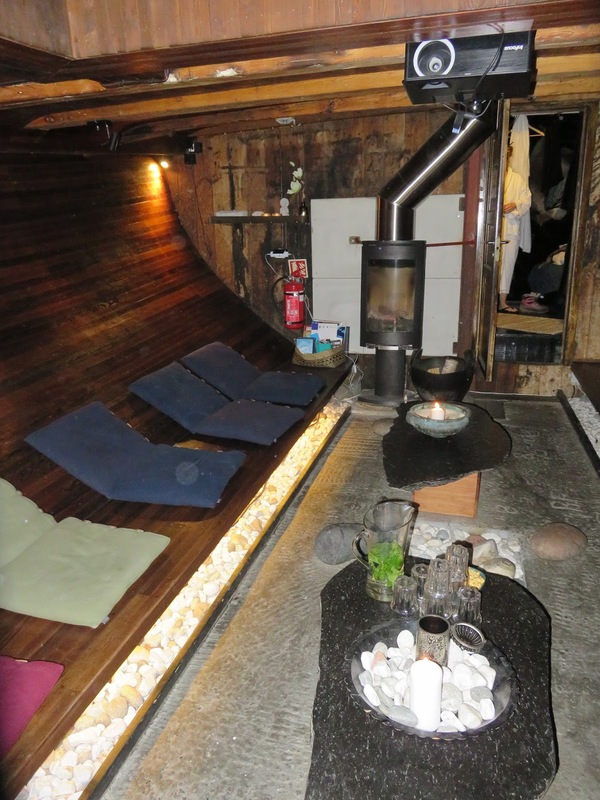 You can just see the wooden tub at the back of the boat – but look inside – chill out zone! The views from the hot tub were amazing. The sun never rises above the horizon at this time of the year, and this means that the sky looks amazing – pink and blue on one side, orange and yellow on the other… stunning! We spent 2 hours alternating between the hot tub and the sauna. I must say it was very surreal sitting in a hot tub with a woolly hat, and then drying off in the sauna. The crew was relaxed, looked after us but mainly left us to our own devices. Halfway through they wandered over and asked very casually if any of us fancied a dip in the Norwegian Sea? Erm, yes we did! There was a ladder off the side of the boat and just taking off my fluffy gown gave me the shivers. So before I had time to change my mind, I took the plunge. I was okay for literally 2 seconds – and I even swam around – another 5 seconds and then that was it. Pins and needles, toes and fingers were getting numb and that was it. I was swearing all the way back up the ladder (only to distract myself from freezing!). It took me 10 whole minutes in an overheated sauna. I thought I was crazy but S went in after me – and then she warmed up and jumped in the sea again!! Impressive. After warming ourselves up, we joined the other guests for lunch. There was fish stew for everyone else, and I was given a giant sandwich – that amazing bread, and stuffed with veggies and loads of avocado. No complaints here. We had lunch with 5 other Norwegian girls who recoiled in horror when we told them we went to Peppes.. and they were so LOVELY, they gave us recommendations on decent restaurants and coffee shops, and more importantly, the ones to avoid – we definitely referred to that list! I so recommend Vulkana – oodles of fun! 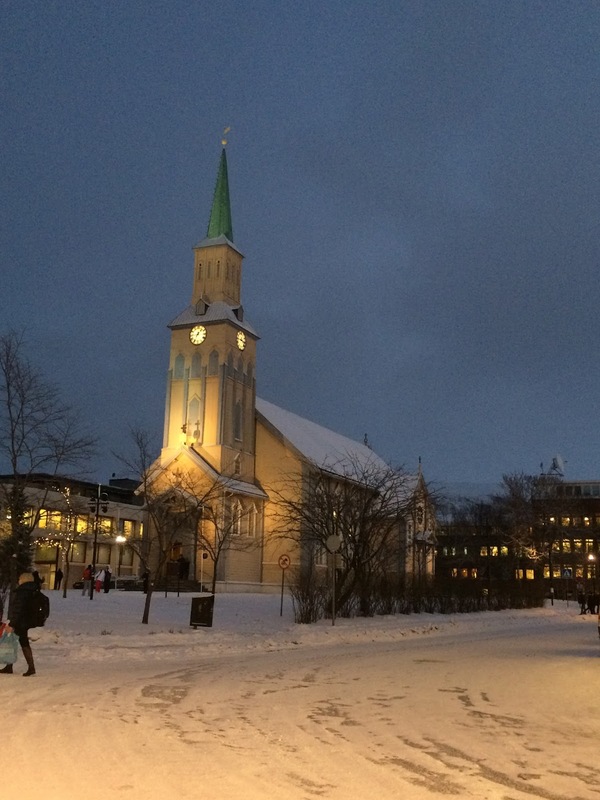 Next activity – walking tour of Tromso. It was 2.5 hrs long and very entertaining. We walked around the city centre (not very big, but beautiful), the Polar Museum, one of the Town Square where there was a Christmas Market. 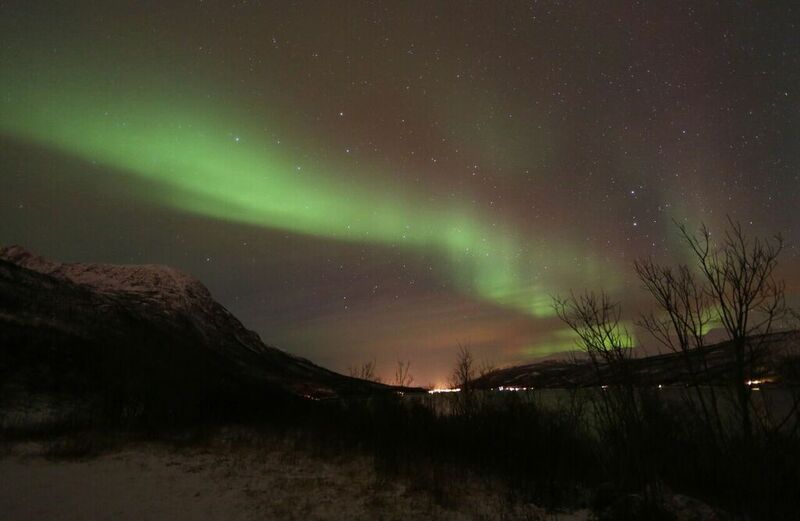 We drove for about an hour and a half before we stopped – to be honest we didn’t have the best conditions to see the lights and to be honest, I was expecting them to be as vivid as all the photographs I’ve seen – they weren’t to the human eye, but on camera – wow wow wow. 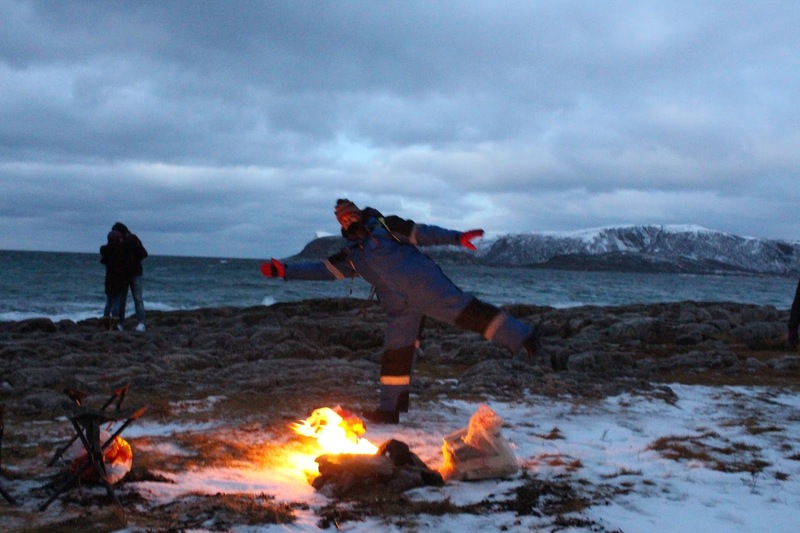 We stopped at some point for a hot meal – Markus and the (superman) driver built a campfire sans gloves (!!!! ), and dished out cups of hot coffee (yes), hot chocolate (no) and hot tea (no), accompanied by a veggie pasta soup-y stew. We got to the hotel around 1am – knackered after a very long day but very happy. And so it begins – the first of my holiday travels, and the first cold holiday I’ve been on. I will exclude going to Toronto in February earlier this year, because that was work related – but it was still terribly cold for a sun child like me. Niagara Falls in Winter – stunning! So before going to Tromso, I went shopping for ski pants, salopettes, base layers, heat techs from uniqlo (which I would definitely recommend for layering up). Once done, there wasn’t much to do other then get to Tromso and start having fun with my two friends, who I’ve known for over 10 years – S & M (hahaha). 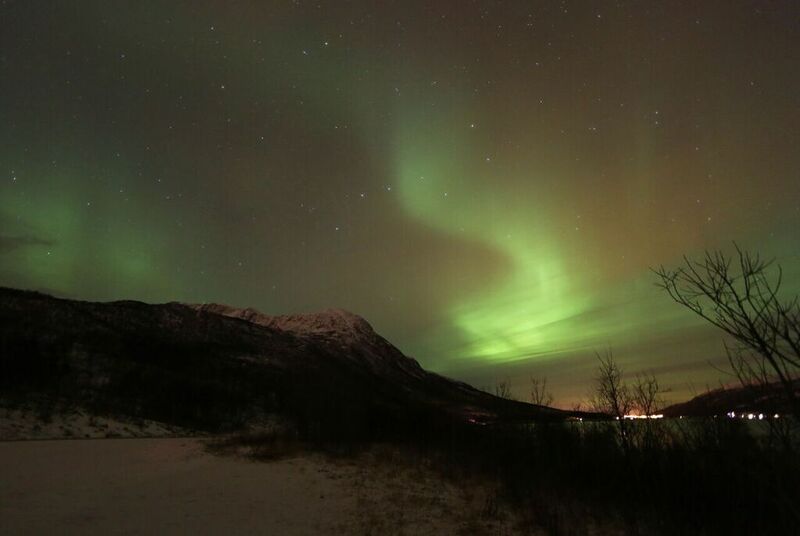 There is a direct flight from Gatwick – just under 4 hours, but with the usual delays, by the time we got to Tromso, waited for a cab and checked into the hotel (thankfully only 15 minutes from the airport), it was almost 10pm. We thought we’d grab a pizza – something quick that will hit the spot. Well, we were wrong on both counts. First piece of advice – never go to Peppes Pizza!! Never ever! And that is where it stopped. The pizza was terrible, the two saving graces were M’s salad with giant spinach leaves and crunchy bacon, and this apple juice. My meal came to about £20 (25% tax), but we know Norway is expensive (definitely not the place for a budget holiday). I think what got me wound up was that I paid that much money for a grim meal. Day 1 over, bring on the proper holiday! 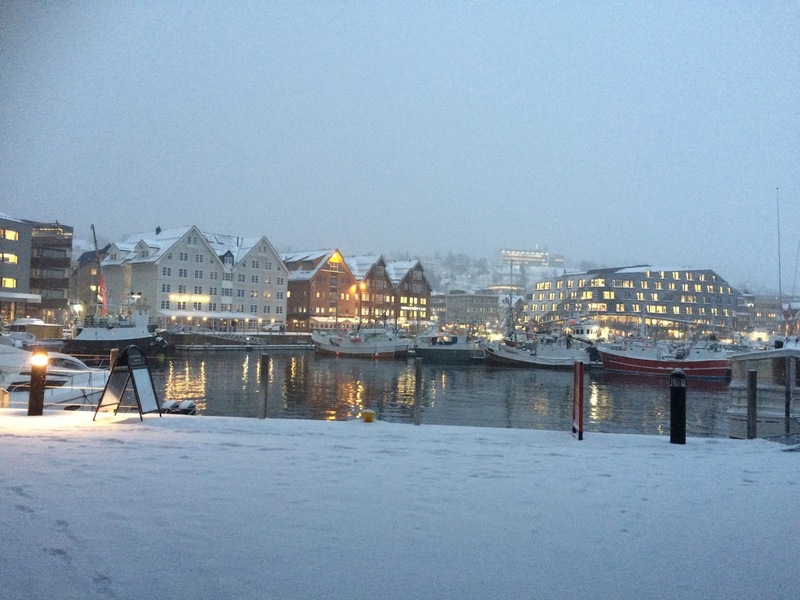 So since I’ll be doing more of this travelling lark next year, I realised I need to up my blogging game in that I will have to blog on the go – not to worry… I have a month to figure it out.. but before that… more about Tromso! © PB Eats, PB Travels. Unauthorised use and/or duplication of the text or any photos without express and written permission from this site’s author is strictly prohibited. Excerpts and links may be used, provided that full and clear credit is given to PB Eats, PB Travels with appropriate and specific direction to the original content.